After spending ample time around a number of seasoned singer/songwriters over the last couple of years, emerging United States country music singer Zack Hayes feels that now is the perfect time to spread his wings and fly! That of course starts with a debut EP that he is currently in the studio putting together, a project that will hopefully be available on the market in the months to come. “I am currently writing and recording my first official project and the “EP” will be my first collection of releases. Spending time in the studio and with other esteemed songwriters has allowed me to grow as an artist and learn on the fly”, said Zack. For the Hickory, North Carolina based musician, it’s all about being authentic in his sound and staying true to country music roots. “My goal is to not only establish myself as a country artist, but to release country music that reflects the music I was raised on; with an added Zack Hayes touch. I hope to reach an audience that reflects a draw to authenticity and true country music songwriting. 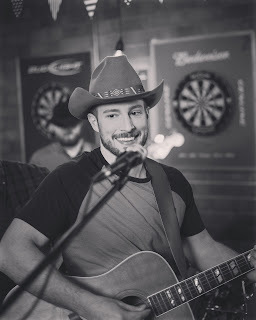 “I take inspiration from traditional country music such as Hank Williams jr, Merle Haggard, George Strait, Brooks and Dunn, Tracy Lawrence, Alan Jackson, and current artists such as Christ Stapleton & Midland. I am a music junkie ranging from the Eagles to Jewel, and anxious to create my own footprint in the industry”, said Hayes. Going forward, the singer/songwriter hopes to make use of all the experience that he has gained from years spent playing for other bands and looks forward to establishing his sound in the years to follow. “I am also a registered traveling nurse which allows me time to spend working on my craft as an artist. I have only just begun playing as a solo artist, but have spent many years playing piano, guitar, and singing as a part of other bands. Growing my fan base, letting people know who I am as an artist, and really beginning my career as a whole is a primary goal for 2019. “Learning most of what I know from being a member of other bands, it has given me lots of second hand experience; I have enjoyed every moment of setting out on my own. Had the privilege of recording in Nashville TN and releasing my first two singles which marked the beginning of my career. I was able to release a music video for my debut single “Signals” which has done wonders for may brand in as far as the recognition and awareness goes”, he said. For an artist whose solo career is still very much in its infancy, things look to already be falling into place for Zack. It is only a matter of time before he starts knocking on the doors of the mainstream industry. “I played my first shows at the end of 2018, have booked my first schedule/dates for gigs in 2019 and also opened up for country music artist Darryl Worley. I attribute all of my current success to never missing a chance to play a local show and setup a genuine, home-felt experience”, said the singer/songwriter.